But, seriously, has this week not felt supercalifragilisticexpialidocious long? I don’t even know if I spelled that right, but since it’s the longest word on planet earth, it seemed fitting to describe an extra-long week…right? You understand. I’m sure it has something to do with the fact that it’s my first full week back at work after a 2 week vacation back home, and now I have the post vacay blues. Have you guys experienced this awful thing? It’s the worst ever. You know what makes it better though? (insert another suspenseful pause here) I’m all about the dramatic effect today. 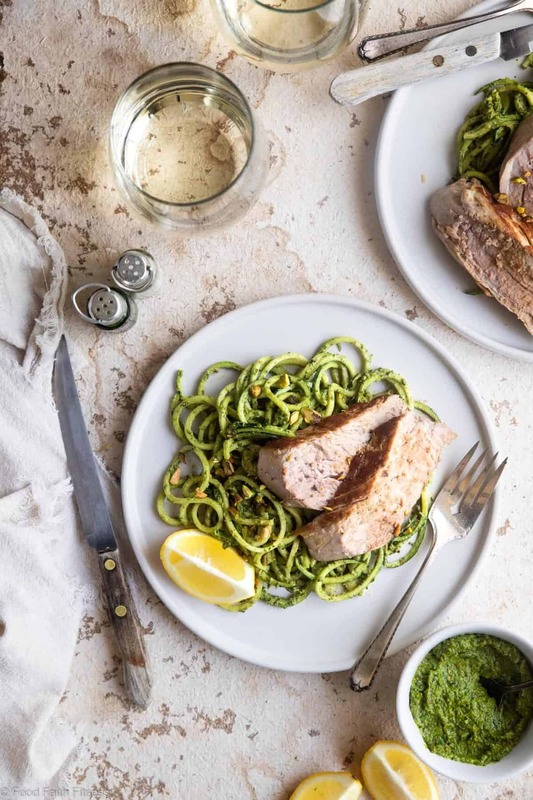 Face planting into the BEST baked pork tenderloin with CREAMY pistachio pesto EVER. 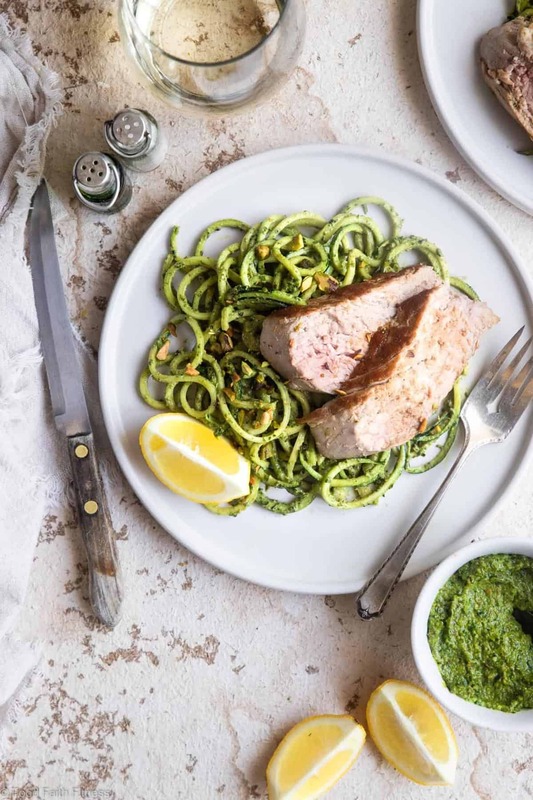 I’m going to be straight up with you: the green goodness that you see crowing this keto pork loin isn’t a traditional pesto, like that zucchini noodles with everything pesto. I mean, you probably guessed that when you read that it had pistachios instead of the typical pine nuts in it. Pistachios are one of Mr. FFF’s favorite nuts EVA and I like them a whole dang lot too. I’ve put them in gluten free shortbread cookies, a Moroccan chicken skillet, and even in a raw vegan tart with chocolate and pistachios. They are ca-ray-zay amazing in all the things. I’m going to be straight up with you, the sequel: you are going to be kickin’ yo’ pine nuts to the curb after yo’ taste buds experience a little bit of this pistachio goodness all up on them. 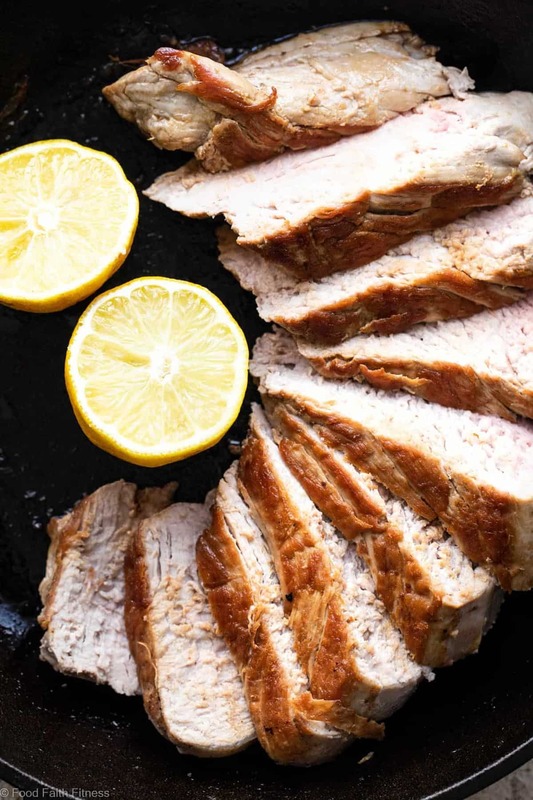 And mingling with the juicy, tender keto pork loin? It’s a combination of dinner BLISS. Another nontraditional point that I should address: this is a lower-fat pesto, which means that it is a lot more solid than it’s traditional, oily counterpart. If you prefer the standard, feel free to add more oil. How-ev-er, the solidity (is that a word? spell check isn’t yelling at me so I am going with it) works really well once ya mix it with the watery zoodles because it kind of breaks it up and turns it into the perfect pesto texture. And, if you don’t like no meat, you can nix the baked pork loin situation. The world is your zoodle, so get funky with it if you please. 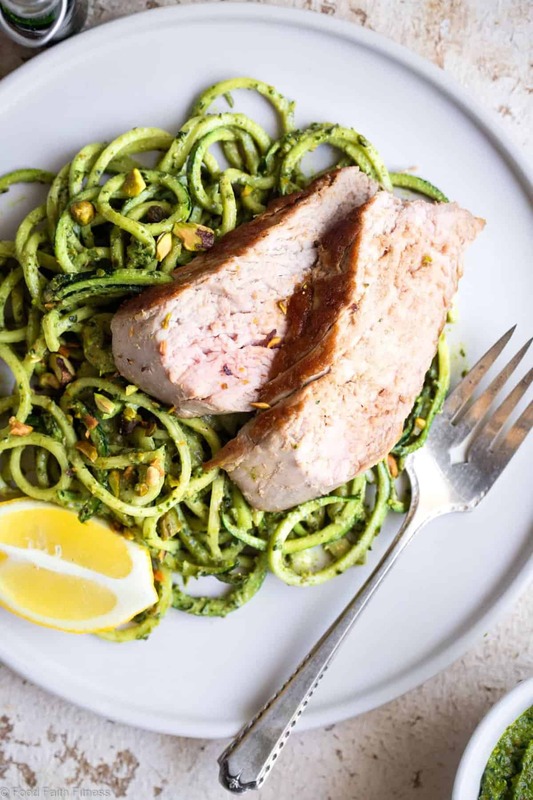 The take home: paleo keto pork tenderloin with pistachio pesto may be the world’s easiest, and quickest cure to I-want-to-curl-up-in-a-little-ball-and-hibernate-like-a-bear-because-I-had-the-longest-week-ever Syndrome. It’s a real thing guys. Wikipedia told me so. Rub the pork with 1/2 Tbsp of olive oil and season with salt and pepper. Heat the remaining 1 Tbsp of olive oil in a large, oven proof pan on medium/high heat. Sear the pork until golden brown on each side, about 2-3 minutes per side. Pop the whole pan into the oven and cook until the pork reaches 145-150 degrees when a thermometer is inserted into the thickest part, about 10-15 minutes. Once cooked, remove the pork from the oven, cover and let rest for 10 minutes. Place the pistachios in a small food processor (mine is 3 cups) and process until roughly chopped. Add in the basil, cilantro, lemon juice and lemon zest. Process until well chopped and combined. 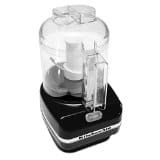 With the machine on, stream in the water and Olive oil until creamy and mixed. 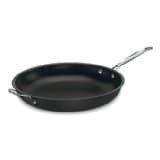 Heat a large skillet (you might need two) on medium heat. Add in the zoodles and cook, stirring occasionally, until soft and lightly brown. Place a long sheet of paper towel on the counter and spread the zoodles onto it. 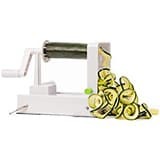 Place another paper towel on top of the zoodles and press out as much moisture as you can. Divide between 4 plates and top with sliced pork, a squeeze of fresh lemon juice and extra pistachios, if desired. *You can also sautee them in a dry pan on high heat until lightly golden brown if you want to get rid of more moisture. They are the best! Thanks Becca! I love everything about this recipe. From the pistachio pesto (genius!) to the roasted pork! And everything in between too (plus the promise of cheesecake)! Cheesecake is always a must. Thank ya Aimee! Definitely allowed cheesecake after a healthy meal..it balances out the calorie FOR SURE. But definitely let me know your results! Happy Friday my friend! This is a great recipe for our family. Thanks Meagan! Right back at ya….TGIF! Sooooooo if i eat a big plate of this this is it ok to eat a giant cheesecake afterwords? Also, hooray for the weekend!!! That is EXACTLY the point! 😉 Happy Friday! I’m going to be so rude because I just want to slurp my way through a big bowl of these! Love all the green. Pesto, come to mama! Oh, girl, be rude allll you want! I feel the same way 😉 Happy Friday! Hi, my name is Ashley and I am addicted to pistachios! Seriously, I can’t get enough of them. I love their crunchy goodness and the uniqe flavor they add to dishes. Can’t wait to try this pesto with pistachios and roasted pork! Thank you so much, happy Friday! Okayy, this is like perfect Friday food! 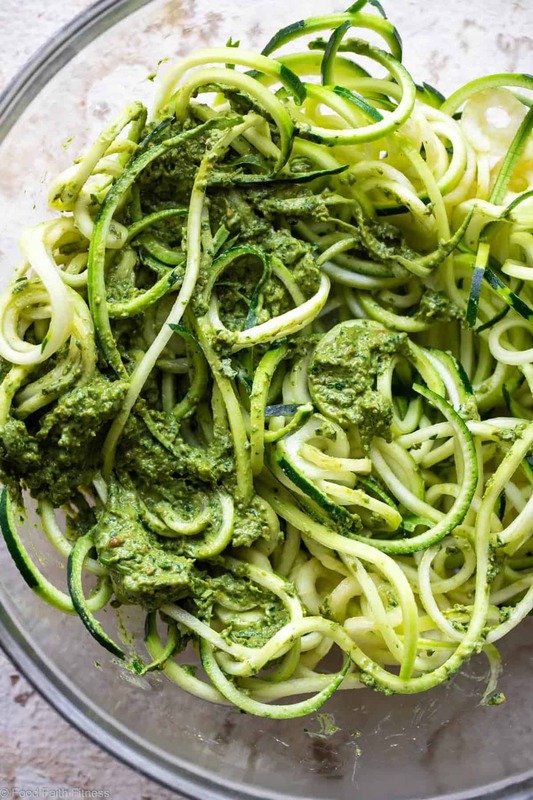 I freaking LOVE pistachio pesto and yours looks amazing over those gorgeous zucchini “noodles”. 😉 Perfect spring dinner. — Have an awesome weekend, Taylor! 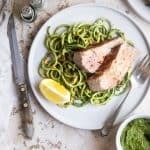 I love the zoodles in the pistachio pesto! Hello yum! The tenderloin makes it so my husband doesn’t feel like I’m starving him! Love it! EXACTLY! My husband was all “zucchini noodles…..” and then I showed him pork…he was happy! Loving these stunning photos and all of the lemons! Love any type of pesto. You and your lemons 😉 Thanks friend! I’am Chantal from Travelling Papilles, i just discover your blog and I like the combination of healthy food and sport. Your recipe is amazing I like the idea of zucchini noodles. Thank you so much Chantal! It’s so nice to have you here! Let me know how you like it 🙂 Have a great weekend!! Can I just say how much I LOVE the word zoodles! It makes me happy just to say it!! Also love pistachio pesto. It is definitely more delicious than pine nut pesto! Isn’t it SO fun?! Thanks girl! Happy weekend! Face-planting into this would make any day, any week, any YEAR better! I adore the vibrant flavor of pesto, and pistachio is such an awesome spin. How yummy! I must try this soon! Have a great weekend! I love it when you call him “huberoni”, you always crack me up!! Also, having cheesecake after a long week of holidays should be the law (aka you’d better make some for me next week when spring break is over because obvious reasons) so don’t apologize. And last but not least: these noodles. That pesto. The meeeeeeaaaaaaaat. 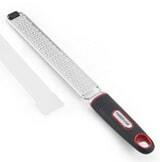 Gimme gimme gimme. Seriously this needs to happen so soon! Giiirrrllll…I’m on the cheesecake request like white on rice! Thanks friend..hope your weekend is splendid too! ZOODLES!! I must try them. I’ve been seeing them everywhere recently!! Zoodles for the WIN! This looks so amazing, lady! And happy weekend – at last! Right back at you! Thanks lovely!! Taylor- I love zucchini noodles! What a great idea on how to enjoy them. Beautiful photos. Thanks Bri!! I love zoodles too! Girl! This looks SO good! I saw it on my phone this past friday and the immediately went to the store and bought zucchini to attempt making them, because yuuuummmm does this look and sound great! Thanks girl! Zoodles are the best!!! What a great sounding meal Taylor! Love the zoodles with the higher-“solidity” pesto haha. And I’m always, ALWAYS a fan of pork anything. YUM! And I’m sure enjoying it on a Friday ups the enjoyment factore exponentially hahaha. Haha I’m glad you approve of the solidity 😉 Thanks Chris! Pork is always a good choice in my books too!